After years in the doldrums, the Zimbabwean agricultural sector is on the rebound, and local startup Zagric plans to be at the centre of its ongoing growth. Founded last October, Zagric is a web-based farmer’s marketplace, enabling agribusiness companies to showcase their products and services. It also provides farmers with context-specific data across the agricultural value chain, capacitating them to make informed decisions. “In the process, we fuel the agricultural economy, enabling agribusiness companies to access new high-growth digital markets and broadening their exposure. Our mission is to take the complexity of traditional marketing and translate it into a cost-effective, simple and accessible all-in-one solution,” Wilson Charangwa, Zagric’s chief executive officer (CEO), told Disrupt Africa. 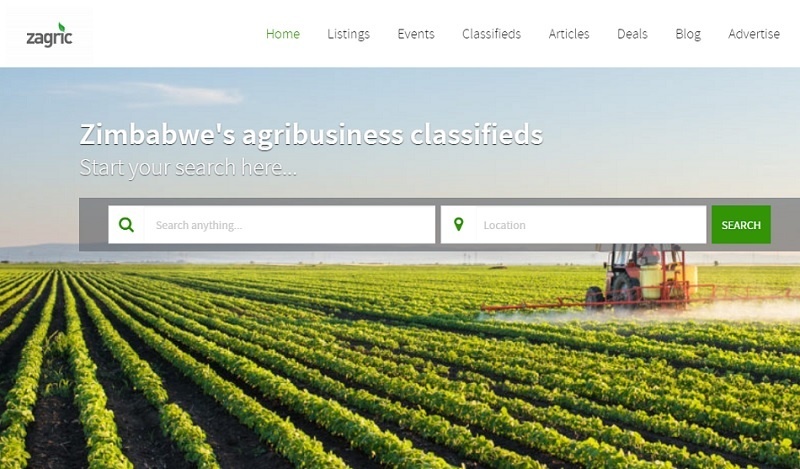 The marketplace provides what Charangwa calls an “holistic” digital platform, aggregating agriculture industry data to enable it to act as an information hub for anyone interested in the Zimbabwean agriculture industry. An agribusiness targeting farmers is able to advertise in different categories, while farmers are also able to market their farm produce. The back-end dashboard enables advertisers to monitor their traffic, while premium listing advertisers can also add promotional codes and deals to their listings. Charangwa said the commercial farming sector in the country is rebounding, but still held back by inefficiencies. “Agriculture information in Zimbabwe is spattered and it adversely affects efficiencies in the industry,” he said. The self-funded Zagric addresses this issue, and Charangwa said uptake has been positive. “We have listed 60 large agribusiness companies as premium companies. By the end of 2019 we intend to on-board 1,000 paying premium listing customers, making inroads also in high potential growth markets on the African continent,” he said.